Stubborn corrosion residues and coking in the nozzle shaft are frequent causes of leaks and malfunctions in modern diesel engines. Nowadays, when injectors are removed, the injector shaft too must always be thoroughly cleaned. That works particularly well with the injector shaft cleaning kit from KS Tools. Whoever uses it can be sure that no residues are left behind in the injector pocket. This is the only way to prevent subsequent damage. That‘s because all contact and sealing surfaces must be contamination-free otherwise the new or revitalised injector cannot seal in the cylinder head cleanly. This results in residues being able to escape afresh from the combustion chamber. The KS Tools product number is 152.1370. There are more and more diesel engined vehicles on our roads. Frequent shortdistance trips, severe heating up and cooling down of the engine and even inexpertly fitted injectors can be potential causes of defective injector sealing rings. 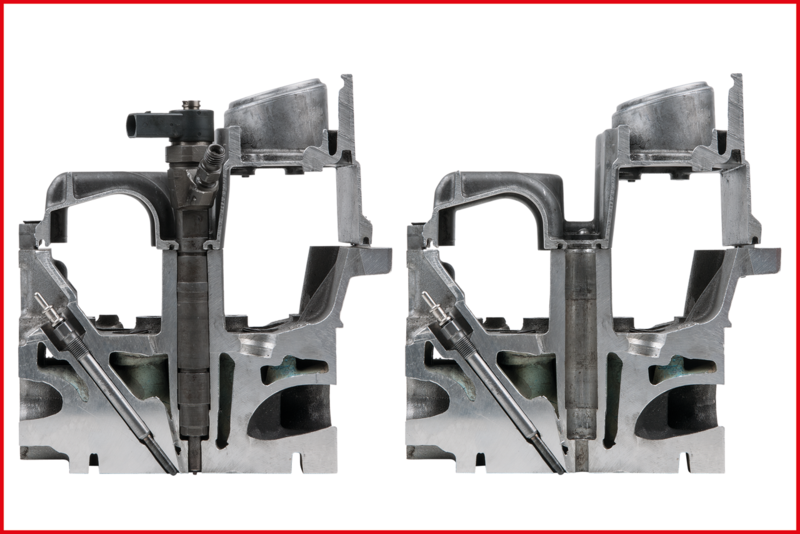 The hot combustion residues then find their way from the combustion chamber directly into the injector shaft and in extreme cases into the camshaft housing or onto the valve cover. The coking becomes stone-hard and makes it well nigh impossible in some cases to remove the injector. Those are the reasons why cleaning the nozzle shaft after removing the injector is so enormously important. Even the tiniest amounts of residue on the sealing surface will prevent a one hundred percent sealing. Unless the old sealing ring has completely burnt away, this must be removed before the cleaning. 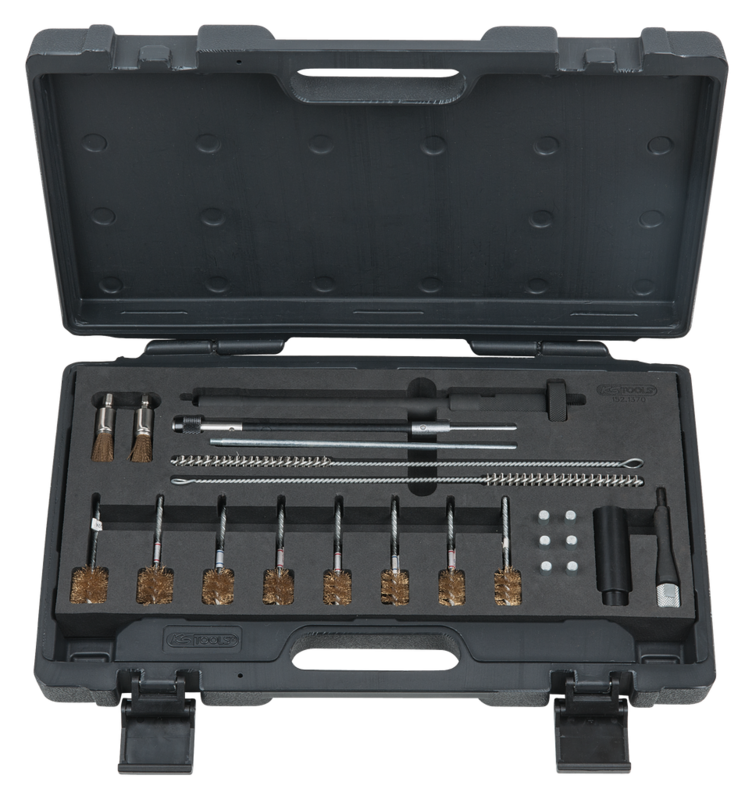 As a special plus, KS Tools has integrated a tool into the kit with which the old injector ring seal can be removed effortlessly. The tool grasps the seal through the bore and is then expanded similarly to an inside bearing puller. In this way the majority of burnt-in sealing rings are held fast and can then be removed without difficulty. The brushes in the tool kit can either be worked by hand or by using a cordless screwdriver. The mechanic must first insert the appropriate blanking plug into the nozzle bore. These prevent the loosened dirt particles from getting into the combustion chamber. There are two stipple-type brushes for cleaning the seal seating available with 1/4 inch end bits. These are easily inserted into the injector shaft with the help of the guide sleeve. The long, flexible shaft with the 1/4 inch end bit provides for connection to a drive tool. The nozzle plug bore is cleaned effectively using the two slim steel wire brushes. Only when all possible contact and sealing surfaces of the injector seating in the cylinder head are clean can the mechanic fit a new or revitalised injector. 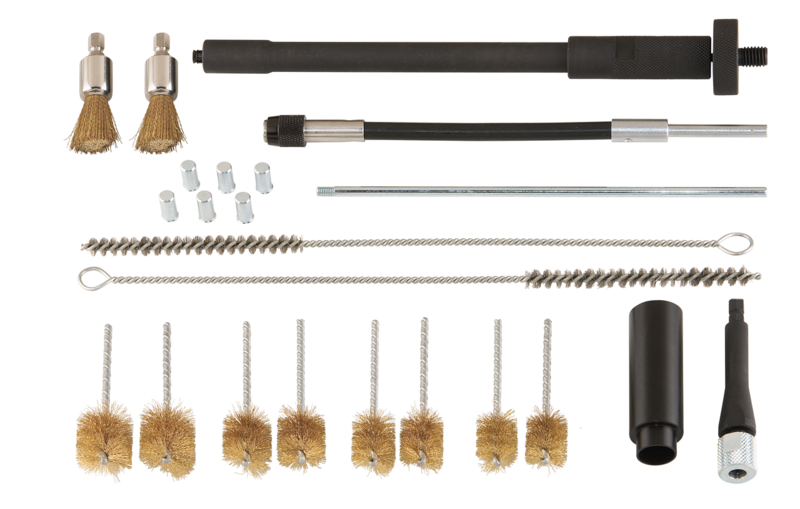 The tool kit from KS Tools contains all the implements for effectively eliminating the combustion residues. These enable both the wall of the injector seating shaft and the injector seal seating and nozzle bore to be professionally cleaned. The kit contains, among other things, tools for common rail engines with Bosch and Delphi injectors and also for HDI engines with diesel direct injection. This makes it an ideal tool for all motor vehicle workshops involved with repairs – from passenger cars to light utility vehicles. The universal kit is suitable for many manufacturers, for example Mercedes, BMW, Peugeot, Citroen, Renault, Fiat, Iveco. It is also suitable for many vans and HGVs. 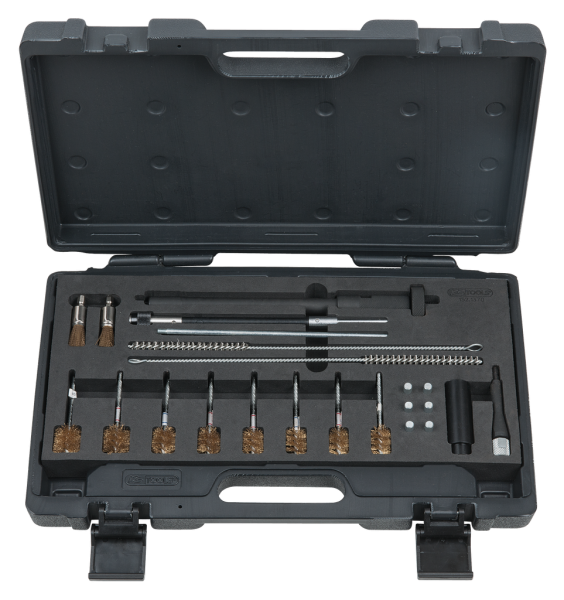 The following tools for injector shaft cleaning are included in the supply: two internal brass brushes each in the diameters 18, 19, 21 and 24 mm as well as two stippletype brushes for the seal seating and two long steel wire brushes with diameter 7.24 mm for the nozzle bores. Also included are the blanking plugs, a special puller for the sealing ring and all adapters for the drive. The assortment is supplied in a clearly arranged plastic case with a foam inlay. All parts can, of course, be purchased later separately.